I’ve been looking back on how I accidentally became a festival organiser. It all started this time last year I looked out from a stately hall across emerald lawns to England’s largest lake. In the distance, I could see a group in a boat, rowing across the sparkling blue of Windermere. 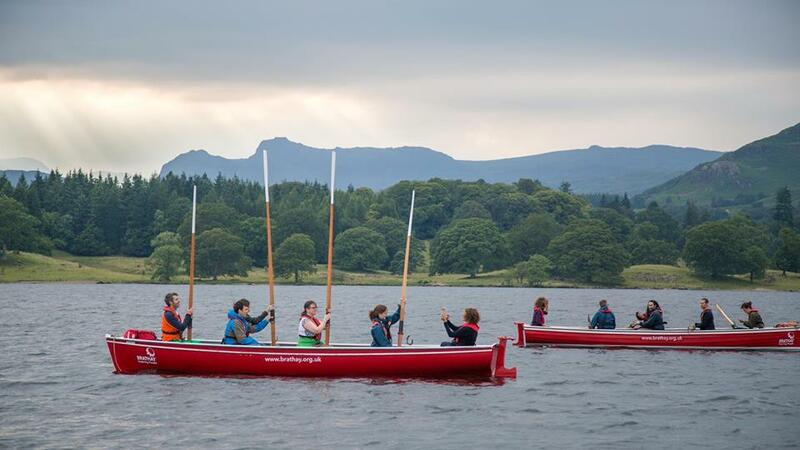 Young people, on a summer camp, doing one of the many outdoor activities offered by the Brathay Trust. This would be a great venue for a festival, I thought. Could we combine a research conference and ideas festival with lots of outdoor and creative activities, from kayaking to drumming, storytelling to flying the zipwire? “Great idea” said Kaz, then head of research at Brathay. After a month of emailing and phone calling, we had an initial programme of remarkable speakers and cool music, complemented by an academic committee, special issue of a journal and sponsorship from Futerra and Reagent. In 2013 I had given the closing keynote for Brathay’s first wellbeing conference, where I argued that individualistic and purposeless notions of wellbeing can be unhelpful, as we must recognise the importance of collective wellbeing – or “sustainability” – and the importance of serving a purpose beyond our selves – or “leadership.” Fast forward two years and I was welcoming 200 people from 20 countries to an event that started with that premise: the Leading Wellbeing Research Festival. It was seamlessly organised by my colleagues Phil, Lucy, Jane, Wendy, Martin and Leander. I recommend you see some of the videos from the festival, including Charles Eisenstein, Nandita Das, Jo Confino, Lynne Franks and Anna Zegna. Or read a reflection on it on the blog of our Institute for Leadership and Sustainability (IFLAS). As participants wanted to stay in touch we have created a facebook group. Some of the participants will reconvene in the Lake District on April 9th for discussions, barn dance and a hike. If you want to join, please tell us via iflas@cumbria.ac.uk That reunion occurs during our next offering on the same theme, which is our Sustainable Leadership Spring School. That also represents the first intake of our new MA in Sustainable Leadership Development. I’ve designed and co-tutor these courses. Click here to learn more about it. In October I will present some of the ideas on leadership that underpinned the Festival and the new MA, at the International Leadership Association in Barcelona. That paper (pdf), co-authored with Richard Little from Impact International, is also relevant for academics with interest in submitting a paper for the special issue of the academic journal we are editing. The deadline for submissions is September 1st 2015. Before then, my next teaching takes the form of a free online course on Money and Society, with one lesson a week for a month from August 23rd (i.e. soon!). The tension between a troika of institutions and a Greek government mandated to resist further austerity has brought the importance of our monetary systems for the future shape of democracy into stark relief. Therefore, in an article for the New Scientist magazine in June I explained the importance of currency innovation for countries facing austerity. Our free course, which I encourage you to enrol on, delves into the very essence of money, its history, current formation and possible future due to currency innovation. An 18 minute lecture presents some of the opening critiques of our current system of bank-issued money. Unfortunately most governments have thus far ignored this aspect of contemporary banking systems in their discussions on an agenda for financing development, which they concluded in Ethiopia in July. Some of us who work on currency innovation sought to inform the negotiations via an inter-agency task force of the UN, but were ultimately unsuccessful. However, on the eve of the UN summit in Addis Ababa, the UN Research Institute for Social Development (UNRISD) published a paper on heterodox monetary theory and currency innovation for development, which I co-wrote with Matthew Slater and Will Ruddick. As far as I’m aware, it is the first UN paper to discuss the implications of Bitcoin and currency innovation. When the knowledge of policy-makers lags behind key challenges and technologies, it feels right to get on and do what you think is useful and might have a massive future. In the case of monetary reform and currency innovation, that is why I’m pleased to join the Advisory Board of Grassroots Economics, a Kenya association that is launching local currencies with business networks across Africa. It is also why I’m starting as a non-executive director of the impact investors Trimantium. With significant sums under management, an ethical pension fund, and investments in crowd-funding platforms and health technologies, the aim of Trimantium is to make capital matter by putting it into profitable businesses that can be part of a viable future for all. On the board I will join experienced investment professionals and tech entrepreneurs, so am looking forward to learning with them. While working on these transformative entrepreneurial approaches is important, there is another more reformist paradigm for our efforts, which is to help manage existing forms of global capitalism a bit better. One key component of many nations economic development strategies has been the establishment of special economic zones, or export processing zones (EPZs). These have tended to give businesses preferential tax rates to encourage them to set up manufacturing operations to export to global markets. On the one hand, many countries are expanding these, while on the other hand, rules established by the World Trade Organisation (WTO) now restrict the amount of ‘trade-distorting’ subsidies that governments can offer to attract investment into such zones. So what is the future of such zones? Could social and environmental excellence become a new basis for their attractiveness for investment? Since March I have been supporting the UN Conference on Trade and Development (UNCTAD) to research this issue. We will launch the report on the future of EPZs at the WTO on October 1st in Geneva. Looking ahead to the new academic year, it is an exciting time for the Institute we launched in 2013, as it diversifies on the basis of the talents and interests of the team. For instance, this autumn my colleague and IFLAS Deputy Director, Dr David Murphy, will teach the opening module of the MSc in Strategic Policing. Through our participation in this MSc, we are integrating our approaches to leadership development, community engagement, stakeholder collaboration, ethics, and sustainability into what is set to become one of the leading policing masters degrees in the UK. Given the strength of international recruitment to this programme it could be an intriguing development for the years to come. We anticipate learning a lot from our colleagues in the policing subject area, and also from the participants on this innovative course.